'No one is on the hook' to minimize bystander risk; UW bioethicist and co-authors advocate for stronger protections in Science commentary. 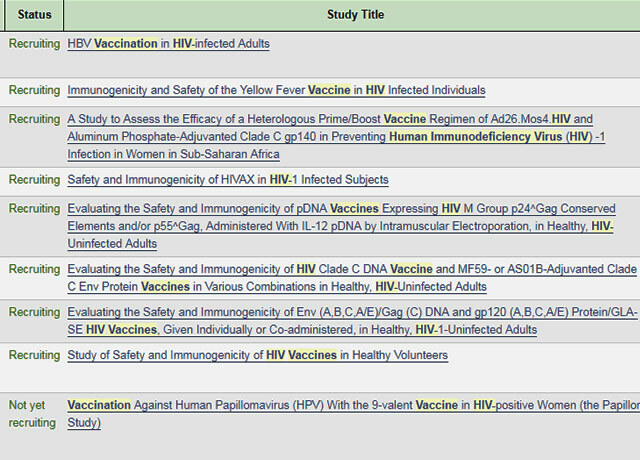 Clinicaltrials.gov's partial list of HIV-related studies. Some trials pose risk to unwitting sexual partners of subjects. At any given time, thousands of people in the United States are taking part in clinical trials – proving grounds for novel medical therapies and devices. Participants’ goals are varied: Some desperately seek to improve their own health or, more altruistically, that of future generations. Others are motivated by the financial compensation, if offered. All subjects are given informed consent documents that communicate trials’ risk of causing adverse health effects. That agreement, however, seems insufficient in studies that also pose risk to the well-being of bystanders – people who have not signed up to participate. Bioethicist Seema Shah was the commentary's lead author. “Scattered protections exist for certain types of bystanders, but there’s no clear systematic way to ensure that third parties are protected,” said Seema Shah, a bioethicist at the University of Washington School of Medicine and Seattle Children’s Research Institute. She is the lead author of a commentary published today in Science that spotlights the ethical liability of conducting trials without a prescribed way to address bystander risk. The commentary proposes a solution, too. The authors’ impetus was a proposed human challenge trial (HCT) in 2016 in which healthy subjects would have been infected with the Zika virus with the hope of identifying a vaccine. At the time, U.S. scientists were scrambling to respond to local outbreaks of an illness that had reached epidemic levels in sites abroad. “I chaired a committee for National Institutes of Health that evaluated whether a Zika HCT could be ethical, and if so, what protections should be in place. So much was unknown about Zika virus at the time that the risks to bystanders in particular were concerning,” Shah said. The NIH put the Zika HCT on hold and its future is in limbo. It would pose bystander risk because test subjects infected with the virus could transmit it to unsuspecting third parties “through sexual activity, pregnancy, mosquito vectors, or other unknown ways,” the authors wrote. Human challenge trials are known to carry bystander risk – and also to have the potential for major societal benefit. Such trials have produced vaccines for smallpox and yellow fever, among other diseases. Around the world today, HCTs are underway with the aim of eradicating scourges such as malaria, cholera, typhoid and schistosomiasis (in which subjects are willingly infected with parasites). Healthy people who sign up to be HCT subjects are likely motivated by the payment, at least in part. Shah knows of a malaria study that paid subjects $2,300 for roughly 40 days of observation, exposure to malaria and an experimental drug, close monitoring, and multiple research procedures. Malaria human challenge trials have been conducted for decades, have relatively low risks, and long-term complications are very unlikely, Shah said. Researchers are obligated to ensure that trial subjects, whether healthy or living with chronic disease, are made aware of the risks of participating – for them and for anyone else deemed at risk. Subjects’ signatures on the “informed consent” forms may serve to satisfy researchers that they have fulfilled that obligation. However, multiple surveys that have found that many subjects do not fully comprehend the risks they sign up for. Who decides if bystander risk exists, and what precautions to take? Balancing the conflicting aspects of risk and societal benefit is researchers’ age-old dilemma. Historically the issue has been left to the discretion of the scientists who propose studies, their funders, and institutional review boards (IRBs) – small panels set up at institutions that conduct research that must approve the design and conduct of all trials involving human subjects. Precautions might involve confining participants in hotel rooms when they are likely to be infectious, having participants protect against mosquito bites for a time by wearing long-sleeved shirts and pants and insect repellant, or doing studies in places where mosquitoes that can transmit diseases don’t live. Shah said it’s difficult to estimate the percentage of U.S. clinical trials that may create bystander risk, given that such research is not clearly identified or “tagged” in a way that allows a running tally for all scientists to see. When asked if IRBs could be the designated agents to identify and quantify cases of bystander risk nationally, Shah responded that the panels are charged only with protecting subjects, not third parties outside the study. Shah and co-authors propose that funding agencies take the lead in managing bystander risk. Agencies would be tasked to create a national database of reviewers: ethicists, policy experts, clinicians, patient representatives and scientists. The agencies also would proactively monitor research proposals for two trigger criteria: “substantial risk to bystanders who cannot protect themselves, and research with contentious risk and highly contingent social value,” the authors wrote. Proposals with those two traits would be subject to scrutiny by a smaller ad-hoc group of reviewers from the national database. That group would render an opinion on the trial’s merit and, if it moves forward, what precautions to take. The opinion would be made public. The co-authors are Jonathan Kimmelman of McGilll University in Canada, Anne Lyerly of the University of North Carolina, Holly Lynch of the University of Pennsylvania, Franklin Miller of Weil Cornell Medical College in New York, Ricardo Palacios of Instituto Butantan in Brazil, Carlos Pardo of Johns Hopkins University in Maryland, and Carmen Zorrilla at the University of Puerto Rico.